On Saturday Milton had a little Fourth of July within itself, with the exception of what will be mentioned further on. The day was ushered in with rain; but this soon ceased, after which the patriotism of the town was evident in the display of bunting, and flags of all sizes, from the porches and windows of private homes. The banks and other public buildings were closed, as were also most of the stores. From an early hour, in fact beginning the day previous, the small boy was in evidence with his crackers and other fireworks. During the morning Firemen Band and a part of the Volunteer Fire Company paraded the streets to the music of the former. It is needless to add that Prof. Ed Bacon, alias “Senator Higgins,” was in his glory[i]. In the afternoon a game of baseball was played between Milton and Greenwood, which was well attended. And on this afternoon it was demonstrated that music hath power to charm, even, the common breast for the dulcet notes of the Band called so many of the citizens to the ball ground that the streets were nearly deserted. The score of the game was three to two, in favor of Greenwood. In the evening quite an assemblage gathered at Hart’s Park where patriotic speeches were made by the following order: T. H. Douglass, J. M. Lank, of Milton; W. D. Stoopes, of Wilmington; A. C. Atkins, Jr., Rev. Martin Damer, and Rev. A. C. McGilton, all of Milton. The Band was on hand and filled the interludes with more music. The day closed with a magnificent pyrotechnic display on the banks of Lake Fanganzyki. No casualties occurred to mar the pleasures of the day, and everyone being sober, as a logical sequence, on Sunday morning everyone felt happy. Mrs. Alena Richardson of Dover, Dr. Walter Hunter of Greenwood, Captain Lucius Darby of Philadelphia were all Milton visitors on the Fourth. Steamer Marie Thomas arrived on Saturday with 6000 cases of empty tomato cans for Goodwin Brothers & Conwell. The Milton School Board met on Friday evening and elected the following teachers: Principal, Prof. Horace Hastings, of Delmar; 1st asst. Prof. E. W. Warren, of Milton; 2nd asst. Miss Lydia A. Black, of Milton; 3rd asst. Miss Elizabeth Johnson, of Millsboro; primary, Mrs. Estella Bacon of Milton. Master Joseph Carey, nephew of the Misses Susie and Sallie Carey of Glenside, Pa., with two comrades occupied the Edwin P. Johnson cottage at Broadkiln Beach a part of last week. He, with his aunt, returned to their homes on Monday. Miss Emma King, who has been spending three months with her brother-in-law and sister—Rev. C. T. Behringer and wife at Swedesboro, N. J., returned home last week. John Cottrell and family have removed from Camden, N. J. to Milton, their former home. The Milton Band has purchased the old Lincoln Band wagon. It has been nicely painted; and those, on its first appearance here, took it as an enlarged chicken coop, or a naphtha launch, have changed their minds. Miss Lydia A. Black is attending the Summer school at Dover. Miss Susie Carey is having built a new residence at one of the farms near Milton, in tenure of Arthur Shockley. The Tabernacle in Lavinia Camp Ground which has been in a bad condition for some time, fell down on Wednesday. This is fortunate, as it will save workmen the trouble of tearing it down to give place for a new one, which is necessary to build for the accommodation of the coming camp. W. D. Stoops, of Wilmington, State Councillor, Jr. O. U. A. M., was the guest of J. M. Lank and family on Saturday and Sunday. Mr. Hartman of Baltimore is the guest of his son, Lemuel Hartman. The Anderson Company has about 1400 cases of tomatoes of last year’s pack yet on hand. The interior of Miss Eva Smith’s millinery store on Union Street is a model of beauty and […]. Everything is up-to-date, with electric lights included. It requires a connoisseur in art to design and execute such arrangements, the style and finish of which are superb. If the lady reader has last doubt as to the veracity of the writer, he takes the privilege of inviting her to call and see for herself. During the heated term the Douglass White Company are closing work at their Shirt and Overall Factory at 5 o’clock p. m.
The M. D. & V. R. R. Co. are keeping their road bed near Milton in fine order. 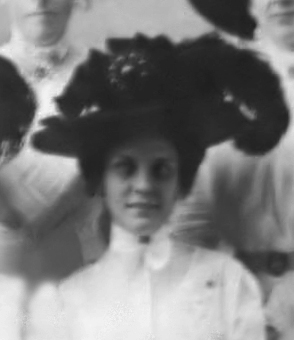 Miss Katie E. Coverdale of Ellendale was the guest of Miss Blanche L. Conner on Monday. On Tuesday at 12 o’clock Miss Mary E. Johnson, elder daughter of Mr. and Mrs. Frank W. Johnson, was united in matrimony with James Oliver Hazzard of Milton. The ceremony was performed at the home of the bride’s parents near town, by the Rev. A. C. McGilton. The bride’s younger sister, Miss Amanda Johnson, was bridesmaid. J. Leon Black was the groom’s best man. After the wedding dinner the bridal pair were escorted to Ellendale, where they took the northbound train for Atlantic City and other points. On Monday evening the 13th, the members and congregation of the M. E. Church will meet to discuss the feasibility and practicability of heating the church with steam apparatus. The idea of generating heat, at the present time, by artificial means would appear paradoxical, but when it is remembered that next winter may be cold and that “large bodies move slowly,” there may be wisdom in the agitation of this measure at the present time. Mary P. Wilkins, daughter of the late Thomas Hart, died at the home of John White at Whitesboro, on Sunday, of Bright’s Disease, aged 55 years […] months and 27 days. The remains were shipped from Nassau on Tuesday morning by S. J. Wilson & Son to Philadelphia, where sepulture was made in Cedar Hill Cemetery. George A. Lekites, son of Mr. and Mrs. Charles Lekites, died at the home of his grandparents, Mr. and Mrs. Mark Shockley, at Overbrook, on Tuesday aged 5 months and 26 days[ii]. Funeral services at his late home on July 2nd, and interment made in the M. E. Cemetery at Lewes, by S. J. Wilson & Son. William Mears had the front of his barber establishment painted on Tuesday, by C. H. Atkins. Steamer Marie Thomas has been chartered by the Franklin B. Wills Company as a tender to assist in building a lighthouse on the Miah-Maul Shoal Light Station, in Delaware Bay, located about 20 miles from Maurice River, and, about 28 mile northwest from Cape May. William Cyr, an employee of the company is here superintending getting white oak timber in order, on Milton dock, for the foundation work. The steamer left, on Tuesday, for her destination, of about four months. S. W. Betts of Frederica was a town visitor on Tuesday. Milton School Board, at its next session, August 7th, will elect a janitor for the school building for the school term. All bids should be in by the date named. [i] This is an obscure association or a private joke, of which David A. Conner made many; there was a Senator Higgins, representing Delaware, who was investigated for taking bribes from the American Sugar Refining Company in 1894 along with many others of his colleagues.